In ‘Operation Redemption – A Vision of Hope in an Age of Turmoil’ Sir George Trevelyan writes about the places of earth power in Albion, earth power that is stored at many sacred locations. He specifically mentions the Holy Mountains of Skirrid, Wrekin, Malvern, Tryfan and Schiehallion. 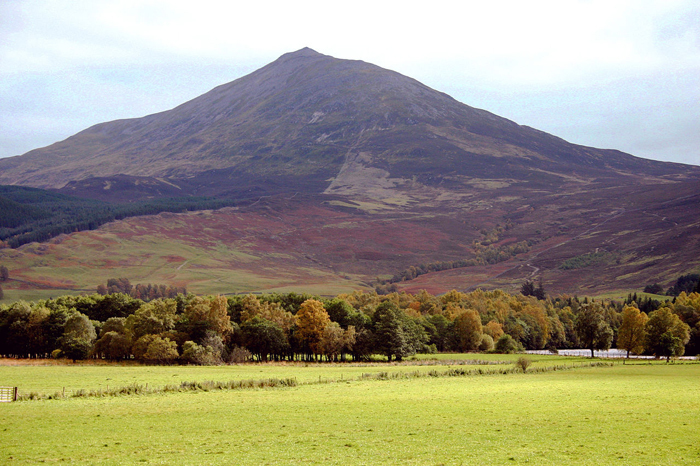 Schiehallion sits at the centre point of Scotland rising to 3,554ft. in Perthshire. Its name derives from Gaelic ‘Sidh Chailleann’ meaning Fairy Hill of the Caledonians or ‘Maiden’s Pap’. It is a central crossing point between Eilean Isa (Isle of Jesus, Skye) and Lindisfarne, between Iona and Montrose and between the Well of Mary at Tobermory on Mull and Marywell (south of Montrose). Schiehallion was the first mountain to be mapped using contour lines. Now it is very popular with climbers and walkers and since 1999 has been cared for by the John Muir Trust who repair and maintain 120 kms. of pathway. 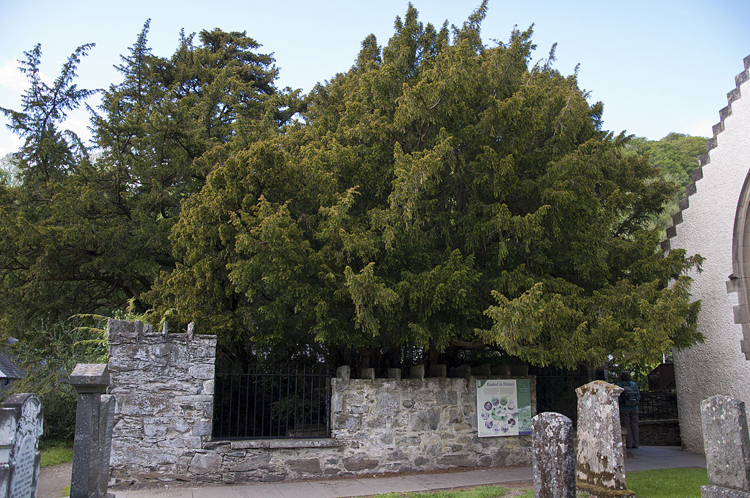 It also is only five miles from Fortingall where stands one of the oldest yew trees; believed to be over 5,000 years old! This tree still stands with, with a massive hollow centre in Fortingall churchyard with a girth of over 56 ft. The yew has long been believed to be an immortal tree of life. Stories abound – close to Fortingall was the seat of the Pictish King Metallaus and legend claims it as the birthplace of Pontius Pilate (10BC?). Pilate’s father was sent by Caesar Augustus to exact tribute from Metallaus and thus Pilate is linked to this area. Cuttings from the tree are sent to the Royal Botanical Gardens in Edinburgh to form part of a mile long hedge whose purpose is to maintain ancient species in the U.K. In ‘The Sacred Yew’ by Anand Cheton and Diana Brueton (Arkana 1994) they point out that vandalism down the centuries has robbed us of the full glory of this tree. Today it has a hollow centre and appears as if it is two trees with one root system. Remarkably (or perhaps not!) there is a good deal of growth still appearing including new berries. Location: Schiehallion lies between Loch Tay, Loch Rannoch and Loch Tummel, about 10 miles (16 kilometres) to the west-north-west of Aberfeldy in Perthshire.